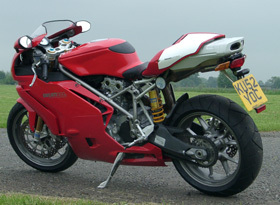 You may remember that when we reviewed the Ducati 999 a few months back we were rather impressed. We didn't expect a great deal from the S version - after all at a glance all you get is some designer suspension and a couple of engine tweaks, so what could be so different? The 999s looks very similar to the base model. 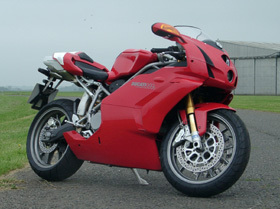 Both are available as single or dual seat versions, both are red and both look better in the flesh than in photos. That's where it ends, though. The 999s simply oozes quality. I have never seen a bike get so much attention from other people, even when strapped on a trailer on a rainy M25. It is an extraordinarily good looking bike. The Ohlins forks and rear suspension just give it an aura that the base model lacks somehow. By the time I had got out of town and a few miles into my test route I was hooked. Half way round the route I was in love, and at the end of my route I filled up with fuel and did it all again. The bike really is that good. The engine changes have released an extra 12bhp and a tiny bit of torque, but the numbers tell only a fraction of the story. It's the way the power is released that does it. It's actually very easy to describe. 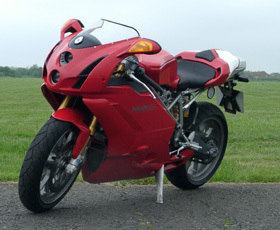 You open the throttle hard and the bike accelerates so fast that the speedo can't keep up. And it carries on doing so until the rev limiter comes in. In pretty well any gear from pretty well any speed. But it's not just huge power and spot-on gearing either. Those pretty forks and shiny shock are so worth the extra money. Turn in and cornering feel are unlike any Ducati I've ever ridden. The bike will turn into a corner without any apparent effort from the rider, and allows mid corner line adjustments with no hassle at all - something most Ducatis would simply refuse to do. The Brembo brakes are unbelievable as well, offering eyeball popping retardation from the pressure of a single finger. Amazing, especially as they appear to be the same as the brakes fitted to the base 999. It just goes to show what serious quality suspension can do. Sitting down, we worked out that the Ohlins forks, rear shock and steering damper alone are worth something around £2500. Add another grand for the engine internals and the price seems pretty reasonable. Running late to deliver the bike to Adrian for a second opinion I was unable to just take the quick way and ride up the motorway. Not because the 999s isn't any good on motorways - it actually handles the boredom very well - but simply because very wide roads with very few corners simply miss the point. The 86 miles from my house to Adrian's took nearly 200 miles to cover. 200 miles braking deeper into corners than I had ever done before, accelerating harder out of corners than I ever had before and smiling so much that my face still hurts. All this with the largest safety margins imaginable as the incredible brakes and beautifully adjustable handling simply allowed me to ride around any unexpected developments with time to spare. There is a but though. This is the type of bike that is likely to be bought by people who don't ride very much and may have limited experience on a modern machine. They may well be buying an image as much as a motorbike. This could be a bad thing. Partly because it is a bike which deserves to be ridden properly and only really works when approached with commitment, and partly because the performance is deceptive and could well see a less experienced rider enjoying some close study of the local hedgerows. The good thing, of course, is that in two or three years time there will be very low mileage never ridden hard examples coming on the market for very keen prices. Riding in town is an interesting experience. The fact that, to all intents and purposes, the mirrors do nothing doesn't help much. Neither does the weight on the wrists or the rather limited steering lock. Oh, and everyone either wants to look, wants to ask what you think of it or wants to beat you off the lights. All this would be more bearable if it wasn't accompanied by the not entirely pleasant sensation of having your thighs and bottom barbecued on the catalytic converter which sits under the rock hard seat. It doesn't smell very nice either. But then again, towns rather miss the point as well. After all this time, I've finally ridden a Ducati on the road which lets me understand how they are able to beat the R1s and GSX-Rs on the track every weekend.